JINKS WRITES AND REWRITES: FEELING SMALL.......just got smaller. A US team of astronomers observed the four-way cosmic smash-up using Nasa's Spitzer and Chandra space telescopes along with ground-based observatories. 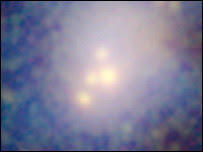 The clashing galaxies are expected to eventually merge into a single, behemoth galaxy up to 10 times as massive as our own Milky Way.